Fresh raw red tomato is roughly chopped along with fresh basil leaves and garlic. They are then ground along with lemon juice, olive oil and seasonings. Serve tomato basil dressing poured over any salad or sliced cucumber or veggies slices. Makes: around a Cup of Tomato Basil Dressing. Wash and roughly chop basil leaves. Place all the ingredients in a food processor and pulse for couple of times. Pour the tomato basil dressing onto a bowl and refrigerate for later use. 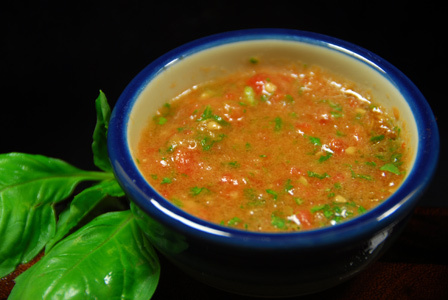 Serve tomato basil dressing poured over any salad or sliced cucumber or veggies slices. Notes: Make sure not to over grind the tomato basil mixture. Suggestions: Adjust amount of basil leaves according to your preference. Variations: You can add the same amount of champagne vinegar or red wine vinegar instead of lemon juice. Other Names: Tomato Basil Dressing.